Gout and edamame is #99 in my list of top 100 topics related to gout. My list summarizes the top searches performed on GoutPal over the last 3 years or so. You can read more about my list in the Gout and You pages. Edamame is a type of soybean. There are a few interesting facts about soybeans. But first, let me clear up a mystery about edamame beans. Though it is one of the top GoutPal search topics, there has been no recent information here about any aspect of edamame. Some time ago I had detailed lists of many foods in what is now the alkalizing gout diet menu guidelines. I have moved the detail to a separate website, and up to now, I have not reconsidered edamame beans. Before I do so, I should tell you that their alkalizing effect is insignificant, so they will not alter pH by anything worth considering. GoutPal visitors have sung the virtues of soybeans for gout for several years with support for Black Bean Broth. Both soy and non-soy beans have helped gout sufferers inflammation. However, these broths are made from black beans whereas edamame beans are eaten in the immature green state. Most supporters of Black Bean Broth agree that the active ingredient is most likely to be anthocyanins. These are also found in cherry juice. But edamame beans have their own trace elements that are interesting to scientists for their anti-inflammatory properties. Again, there are no specific investigations into edamame and gout inflammation. However, isoflavones such as daidzein and genistein are both found in edamame beans. There is some evidence that these isoflavones have anti-inflammatory properties. If you hear of any specific investigations into edamame related to uric acid or inflammation, please share in the gout forum. Coincidentally, we are now in a similar place as yesterday’s gout and cinnamon review. We know that edamame is not bad. We know that edamame is probably good for gout, but we don’t know just how good. Differently, edamame is more useful as a gout food choice than cinnamon, which is more of a flavoring. If you want to try this as a gout food, please see this edamame and gout recipe. I am gradually adding gout recipes to the Gout Food guidelines. If you have recipes that are good for gout, or if you would like me to find some for your favorite foods, please share in the gout forum. 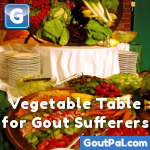 Leave Gout and Edamame to browse Gout Food.